Duette® Shades are available in a wide assortment of beautiful fabrics, rich structures and in three transparencies. This makes precise light control and privacy possible. They give a beautiful pleat pattern to windows of all shapes and sizes. The large range of colours allows you to create the desired atmosphere for your living room, kitchen or bedroom. Duette® Shades do not have any visible drilling holes for the pull cords, providing a beautiful uniform appearance. They can be operated manually or motorised. For example LiteRise for 64 mm Duette®: cordless and easy to operate by pulling the bottom rail. Duette® shades also offer privacy. The desired position of the shades and level the amount of light can be easily controlled. 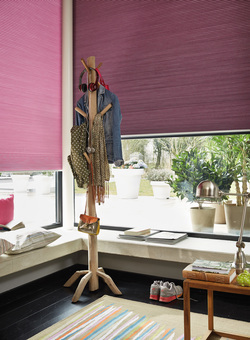 With 7 different ways a duette® shade can be stacked, this blind is ideal for over looked rooms, or for privacy. 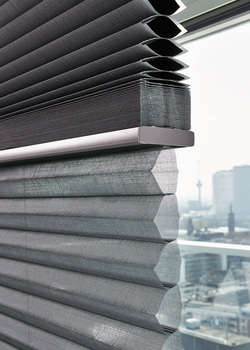 Duette® Shades allow you to choose one of the many black-out fabrics and then combine it with a sheer fabric from our Plissé collection to create the ultimate in privacy.